The consensus of the group was that the claim was fine, and from a regulatory perspective, I agreed. Federal regulation 21 CFR 101.9 requires you to round protein to the nearest gram. I’ll bet you’re anticipating that even though I agreed, I’ve got a lot more to say on the subject. You are correct! Now, there’s nothing inherently wrong with rounding dosages on a label; it’s just that not all companies have your best interest in mind when doing it, especially in the sports supplement industry, which brings me to the point of this rant. Federal regulations should be there to protect you, but unscrupulous players in the industry often find ways to use those regs in their favor, while taking advantage of you along the way. The “Rounding Scam” is often used to make supplements appear better then they are. To understand how this works, first, let me show you the rounding rule for protein, then give you an example to help you better understand it. Then we’ll get into the meat of this week’s rant. In this case, a protein claim of 4.65g must be rounded up to 5g. Although legal, there can be ethical issues that arise when a marketing claim is made on a rounded number. Here, the 5g claim is overstated by 7%—a significant deficiency and enough to raise the issue of misleading advertising with the FTC. More importantly, consumers don’t expect to get shorted 7% of the principal ingredient they are purchasing because of a technicality or loophole in the regulations. We must give consumers what we promise them, regardless of what we can get away with. I caution brands against rounding up in a situation where the protein is the primary purpose of the product. Although rounding complies with FDA regs, it doesn’t comply with the consumer’s belief in what they are purchasing, and in the end, consumer compliance is just as important as regulatory compliance. At NutraBio, I don’t allow rounding up for protein claim; instead, we adjust the formula to meet final label claim. In this case, we would have increased protein from 4.65 to 5g, so that real protein matched label claim and rounding wasn’t necessary. So if I say there is 25g of protein in a serving of a NutraBio product, that is exactly what’s in it. No games – and to prove it we publish 3rd-party lab results of every single batch viewable online by product lot number. I once had a dispute with a company that I felt was deceiving consumers by misusing the rounding rule on its protein powder. Their label claimed to have zero fat and sugar, which wasn’t possible since it was made predominantly of whey concentrate. The label claimed 5g of protein while suggesting the consumer take six servings to get 30g of protein. To the consumer, everything appeared fine on this label, but I recognized the ‘dosing scam’ immediately. I believed the product was purposely formulated with 4.51g of complete protein per serving so the company could legally round it up to show it as 5g on the label. That doesn’t sound like much, but multiply it by six to get one serving, and it adds up. Before confronting them, I sent a sample of their product to the lab. The results proved my theory correct. Talk about playing the system. They deliberately reduced the serving size so low that rounding created a significant shortfall in protein. The scheme was great for them because it lowered their costs, but bad for their customers because they got ripped off. Let’s look at the math to understand how they used rounding rules to rip off their customers. They ultimately want you to take 30 grams of protein (six 5g servings). Had they used one large 30g serving, they would have been limited to using the rounding rule only once—to round 29.51g up to 30g, shorting you only 1.6%. By using six smaller servings, they were able to round 4.51g up to 5g six times, enabling them to short you 10% of the total protein claimed on the label. So each scoop was only short about a half a gram, but since you needed 6 scoops you were shorted a total of 3g. The scam gets even worse. By using the six smaller servings, they were able to use rounding to manipulate the fat and sugar so the label showed zero even though the fat was 2.41g and the sugar was 1.78g. So let’s look at the rounding rules for fat and sugar and the math to see how they cheated you. Let’s start with the fat. So each serving of 4.51g of protein comes from 5.9g of whey concentrate, which, at 7% fat, yields 0.413g of fat. * Since the total fat is under 0.5g, it gets rounded down to zero on the label. You need six servings, and 6 times 0 is 0, so the consumer thinks there’s no fat. However, the real calculation should be 0.413g times 6, which gives us 2.48g of fat per serving. Let’s look at the sugar. Whey concentrate is about 5% sugar, so 5.9g would yield about 0.292g of sugar, which would get rounded down to zero on the label. Once again, the consumer thinks 6 times 0 is 0 when in reality 6 times 0.295 is 1.77g of sugar. Consumers paid for and believed they were getting 30g of protein with zero carbs or fat when in reality they got 27g of protein with 2.48g of fat and 1.77g of sugar. Welcome to the rounding scam. Here is the worst part: what this company did is a well-known industry practice; they create a small “convenience serving” then recommend you take as many of them as you need to fulfill your protein requirements, suggesting 30g as the norm. The consumer thanks to the company for making such an easy way to measure out protein, while the company says your welcome by giving them the finger. As a caveat to this rant, I need to mention that regulations require us to use the rounding rules for the calories, macros, micros and even the Daily Values. So, unfortunately, sometimes what you read on a label is not exactly what you get in the bottle, there is just no way around it. 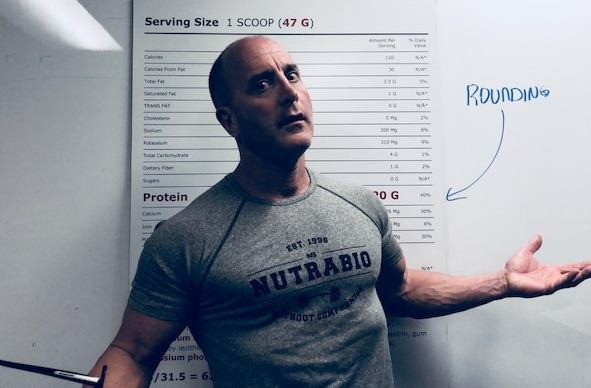 Over the years, many of you have sent me examples of competitor labels where the macros didn’t add up to calories, and I have often defended them. Now you understand why: the rounding rules! You might see a label where the calorie/macro ratio is off by 9%. It doesn’t necessarily mean the label is wrong; it could be that the calories had to be rounded from 85 up to 90, creating a 6% discrepancy, while the macros rounded down by 3%. Sometimes, it’s not the brand cheating you; it’s just the regulations forcing these label discrepancies. A trustworthy brand will always do its best to keep its label as accurate as possible while abiding by the rounding rules. Honest brands will work the formulation to match it as close as they can to the rounded claim so, in the end, the label is an honest representation of the supplement. But buyer beware, there will always be scammers out there trying to rip you off by using the rounding game to their advantage. These are often the same companies that use amino spiking and other industry scams I have exposed in the past. The more educated you are, the better you can protect yourself. In 1974, Sy Syms coined the saying “An educated consumer is our best customer.” I believe wholeheartedly in that slogan, and nowhere is education more critical than in the supplement industry. It’s why I have devoted so much time over the last 20 years exposing industry scams through my seminars, videos, and rants like the one you’re reading now. Companies expect you to trust them; but I don’t have much confidence in trust, I believe in verification and so should you. Demand transparency on supplement labels, question proprietary blends, ask for lab results. It’s your body. You have the right to know what you’re putting in it. This entry was posted in Mark Glazier's Weekly Rant. Bookmark the permalink. This is fundamentally a political issue. The U.S. Constitution does not give the Federal Government any authority over food and drugs. What happens is corporatocracy, wherein the very industry that is supposed to be regulated actually controls the government agency. Such is the case with the FDA, where the heads almost always go on to multi-million dollar positions with the VERY SAME companies they were regulating during their brief tenures with the FDA! Do an internet search on “FDA controlled by corporations” and see what comes up. I am not opposed to capitalism and private enterprise, they are the backbone of America! But corporatocracy is not free market capitalism. A much more efficient system would be to follow the Constitution and let the individual states regulate the industries. Not only are 50 individual state agencies much more difficult to bribe, control, and manipulate; but state level government is much more responsive to the people than the federal level. Think about it. And this is the reason why I buy your products vs GNC or any other supplement companies. I have seen more of a result in a 2 weeks than I did with anything else. To you and your company cheers. This is exactly why I started using your supplements, and have been very happy ever since!! People like mark got in ro this business because of animus and it’s for this reason it is the perfect brand to support some formulations might need some work but overall it’s always clean it’s the hatred of deception that continuously and consistently brings me back to this brand but overall it’s always clean. Thanks Bob, appreciate the feedback, and I’m always for any suggestions. Mark, I really enjoy reading your articles. Good details on how the consumers are getting cheated by labels claims and the loopholes in the labeling regulations. I have some comments here. Is that 0.5 grams rounding rule really makes the difference? 1. Production floor scales accuracy and precision: we all know that big capacity scales are not that accurate unless you are buying a really expensive one that can be accurate at 0.01 grams. 2. Set up of allowable reconciliation yields % at each step of the manufacturing: if you had set up as acceptable 98-102 % then you allow variances. Although this is acceptable even in pharma industry, I am sure that food or supplements manufacturers are practicing larger ranges for their reconciliation yields. 3. Indexing a regular auger filler will not allow you to fill your protein jars with better than +/- 5% precision. This is another source of introducing errors in simply the number of full servings per container. 4. The bulk density of your mixed powders and the scoop size capacity will also introduce errors in your per scoop amount of protein, sugar or carbohydrates. You can have a round scoop or a leveled scoop to yield your declared amount per scoop or per serving. Honestly, even if you say it on the directions of usage, how many consumers will measure a rounded scoop or a leveled scoop to get the exact weight per serving? Not too many in my opinion. Let’s be honest here. Majority of the manufacturers are build based on second hand equipment that is not the top quality when comes to precision. 4. Labeling as “food” (nutritional fact panels) and labeling as “dietary supplement” (supplement facts panel) – different regulatory rules applies. Some will tell you that to meet 100% label claim you have to actually have not less than 90% of the declared amounts in the products – simply look up USP pharmacopeia monographs for some supplements. The 90%-110% label claims is a common range accepted by the industry and other third-party GMP certification companies out there where when we want to be “ GMP certified”. Is based more from the testing methods accuracy and blending uniformity validation stand point rather than anything else. 10% of the declared amount can be acceptable in supplements industry but not acceptable in food labeling where the “protein” should be at least 100% label claim. I can promise all manufacturers or majority will not practice intentional overages just because they want their cost down. I can also tell you that majority of these manufacturers are not conducting stability studies yet because again the cost and the lengthy amount of time that has to be allowed to acquire these data. To practice intentional overages, you really need to have stability data for individual raw materials and I know that many of these studies are not available for a lot of ingredients used as supplements today. Practicing overages is also good when comes to tests because if you add more than you will make sure you will get at least 100% of the labeled amount if not more. A simple solution to adulteration and a method for a true amino acids profile? Obsolete the old AOAC or Dumas method of Nitrogen based off testing proteins and enforce HPLC methods that give you all the individual amino acids profile or at least methods that use specific tags for amino acids. In this way, you will know the true profile, eliminate the spiking/adulteration of proteins with Taurine or Glycine other high nitrogen-containing compounds. Until this is enforced you will never know the true level of your proteins that you are buying. Thank you for answering in such detail. I agree with most all of your points. In other blogs and videos, I discuss many of the other areas where quality is lost either in the manufacturing process or by gimmicks and scams manufacturers use: i.e., nitrogen spiking, WPC bait & switch, prop blends, etc. I even mention in this blog the cumulative effect when other scams are added. Point 1: Agree: Our pharmacy department (weighing) has multiple scales to account for various weight ranges: mcg, mg, g, and multiple kilo range scales. A formal training program in our SOPs ensures that each staff member has been trained in choosing the proper scale and use of that scale. Our scales are NTEP certified, validated daily before use, and validated quarterly by 3rd-party. Point 2: Agree: we have (+-)2% tolerances at various control points: weighing, blending, sifting, encapsulation, etc. all of which are logged in BPR and approved by QA. Point 3: Agree: We use check weighers, or we have online operators manually pulling bottles and checking weights, although not super efficient from a costing view – we do verify each bottle. Point 4: Agree: Not much you can do in this area since dosage is in weight and scoop is volume, which is why we recommend the use of a gram scale when the serving size is critical. We also have only line technicians checking fill weights to verify scoop size on each lot. Agree with your point on equipment as well, which is one reason I do NOT use contract manufacturers, instead use my own cGMP mfg facility. 90% of my equipment was purchased new and is under three years old, and is maintained by a full mechanic staff. If blender RPMs change, the blend changes – properly maintained equipment is a must. Point 4-2: Somewhat agree with you here. CFR Part 111 mandates dietary supplement must meet label claim and must be tested for purity, potency, composition, and identity. Although the manufacturer will allow for a testing variance, the FDA does not. We’ve gone through four CFR 111 GMP audits. The FDA will take ten samples and average out. The samples themselves will be allowed a variance of +- 5%, but the average of 10 samples must be dead on label claim. Point 5: Agree on overages and stability testing 100%. Also, agree on your nitrogen spiking point. I have been exposing this industry scam for over 12 years. I have given hundreds of lectures on spiking. I was the first to create a compendium of nitrogen values for amino acids and nitrogenous ingredients. All of my protein powders make the label claim that 100% of the claimed protein comes from whey protein (or another source). We also declare on the supp facts panel the dosage of each protein source along with the corresponding protein value for each source. My label will disclose where every mg of declared protein comes from. Here is the big picture problem: You and I can agree all we want on these points, in the end, CFR 111 does cover most of this. The problem is in 2016 the FDA budget for dietary supplement division was only $4M. Congress passed GMP regs in 2008 but never funded the enforcement of them. The FDA has the bark but no bite. The hopes are now the DV division was upgraded to its own, OFFICE, that Congress will now provide the proper funding for them to enforce the regs that are already on the books. Thanks Mark. We are on the same page . In the end I still believe these blog discussions will be benefiscial for the industry and for us . I am looking forward to see your new posts . I really enjoy it. Absolutely agree, these discussion are priceless for consumers. The more they understand the more they demand. The gov’t can make refs, but companies will respond to consumer demand. The more education we get out there the better. If you don’t mind I would like to post our discussion on our Facebook page as well. I need our names there public because we are a part of the industry experts. Thanks a lot and I would love to meet you in person . I will be at SSW in Vegas if you attend that show . I just emailed you my contact info. I will be at Expo West in Anaheim next week and will be at SSW in Vegas this year as well. Please add me on Facebook . Thanks for your passion Mark, your heart is in the right place. I always believed “if the customer is happy the business will take care of itself” and I can say, I have been a regular customer for over ten years and I don’t have to ever worry about what I’m getting, I’ve always seen quicker and more pronounced results when I try any new product from you. I’m sold on this brand and recommend it to anyone who is looking for a Vitamin or Supplement every chance I get.